This non-fiction book centres on a typical bus journey where the passengers are stuck in busy traffic. 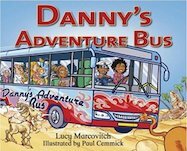 A boy passenger called Danny responds by putting on his own driver’s hat and taking the bus on some fascinating adventures to rainforests, deserts and underwater. Brooke particularly enjoyed this, commenting: ‘It was good because he went to a lot of different places’. The illustrations are simple, colourful and cleverly drawn, with added humour on each page. Robbie commented on how much he liked the pictures. The illustrations also give clues as to what is coming up next in the book and this helped to focus the children’s attention as they listened to the story. The characters in the story represent people of different ethnic backgrounds, allowing all readers to feel that bit more involved. The book also allowed the class to compare the different environments featured. A lovely story book – ideal for whole-class discussions.